Based near Inverness, the capital of the Highlands of Scotland, it is a beautiful, unspoilt, unpolluted, wild and not a little bit wet highland home. They have their own organic farm where the malting barley is grown for the brewing. There is even their very own brewery house cow, Molly, who eats the malt from the brewery mash tun and gives them 20 pints of fresh milk each day. 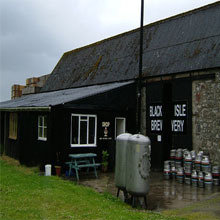 The Black Isle is famous for the quality of its malting barley and it was here on our farm, at Allangrange, that Sir Roderick Mackenzie recorded, in the Statistical Account of 1790, that he land was first cultivated for growing barley because it was found to be of "superior quality for the brewer and distiller." They started brewing from a bucket in a shed in 1998 and nnow brew up to 10,000 litres per day in packaged bottles, casks and kegs.